Corio bay inner harbour saw big Snapper, garfish and snotty trevally caught along with the pinkie snapper, salmon and flathead that have been biting well for a while now. Those chasing the big winter snapper have had best results with unweighted or lightly weighted baits like fresh caught garfish and pilchard. Snotty trevally were present around structure like Cunningham pier and the Geelong yacht club while the garfish provided fishing opportunities for those fishing off the rocks at Limeburners and St.Helens boat ramps. Torquay to Apollo bay will fish well with baits like unweighted scrub worms and small freshwater yabbies. Soft plastic anglers have had great results too with lightly weighted creature baits. Local surf beaches are on fire with some fantastic salmon fishing to be had. 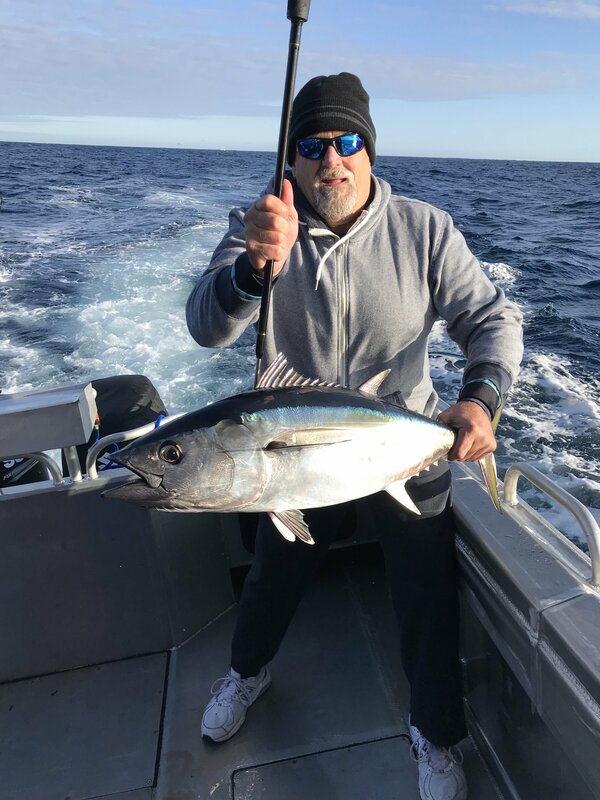 Jan Juc, Bancoora, Anglesea and Moggs creek have all been hot spots with some anglers bagging out in little time. Casting 20-60gram metal lures or using pilchard or bluebait are effective techniques. The tuna fishing continued to attract anglers to the south west coast. Portland, port fairy and Apollo Bay were all hot spots for fish ranging in size from 15kg to over 120kg. 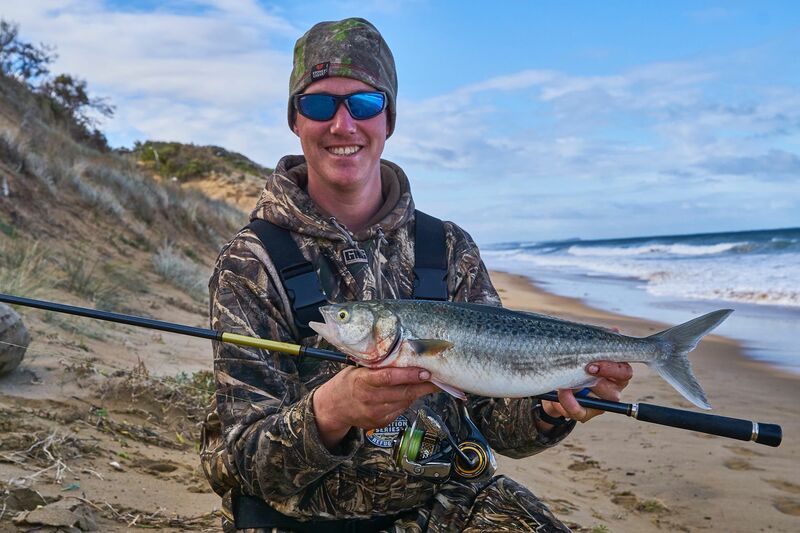 Those chasing a barrel should keep an eye on Apollo bay with reports of numerous fish taken in excess of 100kg, a majority of the school fish have been caught out near the shelf from Portland and Port Fairy in 100-130 meters of water. Chris from Gone Fishing charters has been guiding his clients onto numerous fish out from Portland. Freshwater fishing of late has been outstanding with Lake Purrumbete producing brown trout in excess of 10lb to those flat line trolling tassie devils. Dropping soft plastics or worms in 4-8 meters on the outside of the weed beds is a great way of targeting the redfin that are in plague numbers. Wurdibuloc reservoir again saw some fantastic redfin caught for those casting soft plastics on 1/4oz jigheads and the odd brown trout was also caught using hardbody minnow lures and bladed spinners. Lake Bolac has been fishing very well for rainbow trout to 3kg and above. Using Powerbait is ideal with pilchard fillets also accounting for fish. Reports suggest that patience is the key with a number of anglers noting they fished for several hours without a touch before the fish seemed to switch on and start to bite. Plenty of Crays around the Goulburn River at Nagambie at the moment, from the 2 Wineries to Chinamans Bridge the best spots to try, make sure your nets are in the deeper parts of the River for best results and double check your regulations, Fisheries Officers are reporting plenty of Non-compliences, please make sure you do the right thing, this is a great fishery that we need to keep. Below the Weir and the Crays are fishing really well, hot spots are Murchison East and Toolamba down Cemetery Bend way, also some nice sized Cod being caught also, casting Bassman and 4D Spinnerbaits, Trolling Size 1 Stumpjumpers and Old Mate's working the best and Scrubworms and Cheese the best baits. We are still getting some reports of smoe nice sized Cod around the township of Shepparton, bait is the preferred method, Scubworms, Yabbies and Cheese working well from the bank behind Aqua Moves, the park at the end of Balaclava Road and Pyke road in Mooroopna. Redfin are still being caught a good numbers and the size seems to be better, numbers might be down from 100 per session to 50, but you may get 25 good sized fish amongst them at the moment, trolling small hardbodies to find the fish or using your sounder, then bobbing small Yabbies and Worms or Soft Plastics working the best. The Channels in this area are very quiet. We haven't heard of much happening in the River at the moment, very hit and miss, Fisho's are spending plenty of time catching nothing to get 1 big fish, hopefully over the next week or so, the River will settle a bit and become a little more consistant. Lake Mulwala is pretty much gone for boat Fisho's, however the Fisho's making the effort to launch Kayaks are having great success, Big Swimbaits in the shallows producing the bigger Cod. Lake Eildon is probably the standout out at the moment, if your fishing with a couple of mates, you can put a range of lures such as a Size 1 Stumpjumper, a RMG Poltergeist 50, a Size 3 Stumpjumpers and a Tassie Devil and catch anything from a Cod, Yellowbelly, Redfin and some nice Trout, who wouldn't like to get that bag over a weekend? 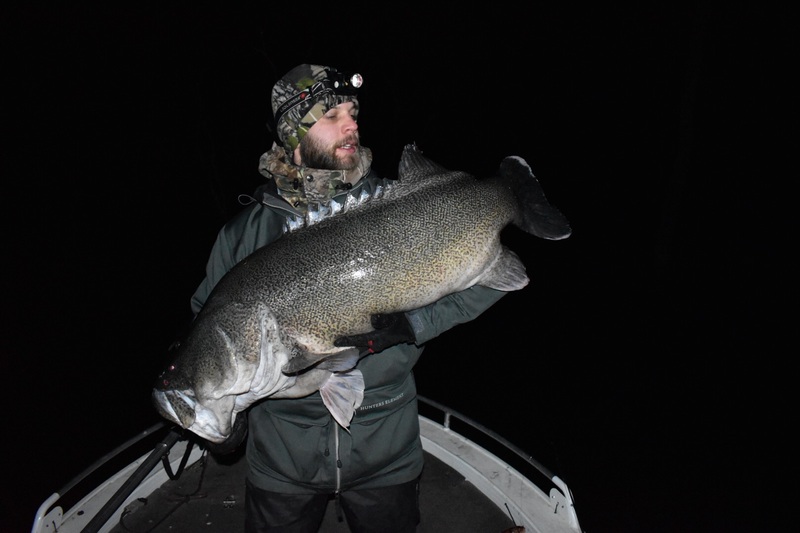 This is another great report from Colby, it will give you some area's to focus your attention to if planning a trip to Lake Eildon. Lake Eildon is starting to rise after the recent rains in the past week, the lake is now at 56% and with all of the rivers running most of the spawning trout have headed up them however there is still plenty in the lake, once again the pink tazzie devil is doing the damage along with small deep diving hard bodies like size 3.5 stump jumpers scoring anglers trout in most parts of the lake on the troll. There has been plenty of Redfin being caught up the Howqua inlet on size 3.5 stump jumpers in the brighter colours with locals catching around 30 on the cast. Smaller Murray cod have been quite but the Bigger Cod have come out to play with lots of reports of big cod over a metre being caught on the troll around Goughs bay in the deeper waters, they were picked up on size 1 stump jumpers in the darker colours and large black and red spinnerbaits on the troll.